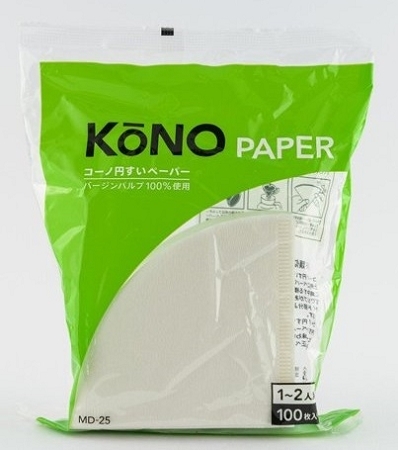 KONO Filter papers, 100 pc count in each package, white bleached filter paper, manufactured by KONO in Japan. From our personal experience we can make the following observations about the KONO filters - the paper is quite thick in comparison to most others, almost approaching Chemex style thickness. The bleaching agent used leaves no odd taste, and we can successfully use these filters 'dry' with no pre-rinse required. The filter requires no preliminary folding when using with the KONO dripper cones. The thickness of the filter makes them reuseable, should you decide to go there! We have, and still do, at times! This is original KONO brand filters, developed specifically for use in the KONO Meimon 1-2 person Dripper Cones. Copyright Orphan Espresso Design Shop. All Rights Reserved.